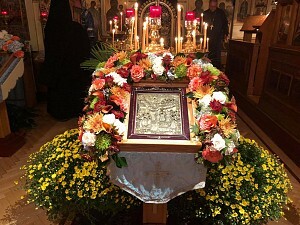 His Grace arrived on Saturday evening for the All-Night Vigil, where he was co-served by parish rector Archpriest Elias Gorsky, pastor emeritus Archpriest George Larin, Archpriest Chad Williams (rector of St. Alexander Nevsky Memorial Church in Richmond, ME), Archpriest Alexander Botschagow (rector of Holy Fathers Church in New York City), parish Protodeacon Dimitri Temidis, and Deacon Alexey Pnev (cleric of the New Kursk Root Hermitage in Mahopac, NY). The parish remains a community wherein many parishioners live within walking distance of the church, and so the congregation gradually increased during the service; while there had been relatively few people at the very beginning, by the litia at Vespers there were already many more, and by the Polyeleos, and anointing with oil after the Matins Gospel, the church was filled to capacity. A full choir sang at all the services, and the clergy and others were welcomed to a splendid supper at the nearby home of Fr. George Larin, where fellowship continued late into the night. 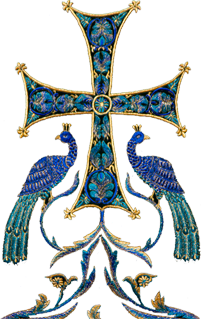 On Sunday morning, the meeting of the bishop was followed by the vesting, the Hours, and hierarchical Divine Liturgy. Clergy in the morning were four priests once again, but with Archpriest Vasiliy Raskovskiy taking the place of Fr. Alexander (who was serving in his own parish). Four deacons served: Fr. 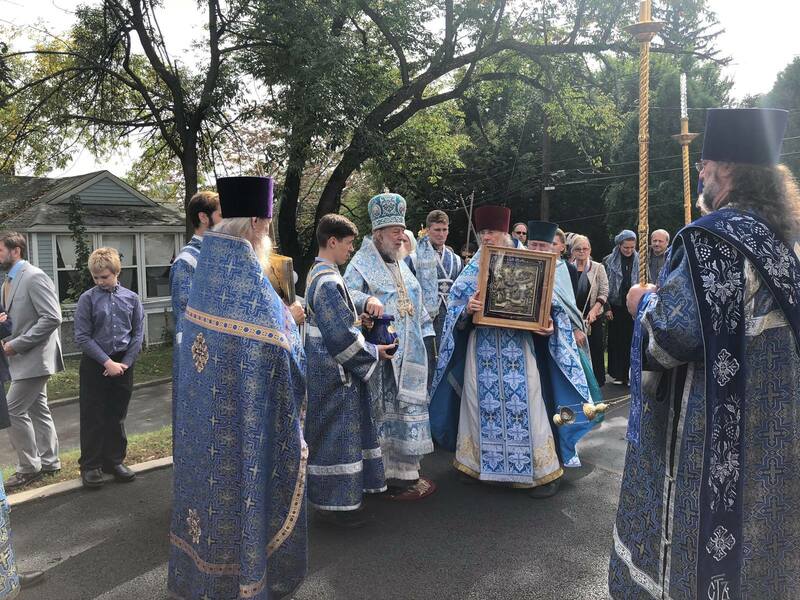 Dimitri Temidis, Protodeacon Serge Arlievsky (cleric of Holy Dormition Convent "Novo-Diveevo" in Nanuet, NY), and Deacons Michael Pavuk (cleric of St. John the Baptist Cathedral in Mayfield, PA) and Andrei Podymow (parish cleric). At the Little Entrance, Fr. Andrei Podymow was awarded the double orarion. The Epistle and Gospel were read in Slavonic and English, and Bishop Jerome delivered two short sermons: one in Russian on the words "the Gospel which was preached is not after man" (Galatians 1:11) from the Sunday Epistle; and in English on the words "the first covenant had also ordinances of divine service, and a worldly sanctuary" (Hebrews 9:1) from the Epistle for the feast of the Protection of the Holy Virgin. 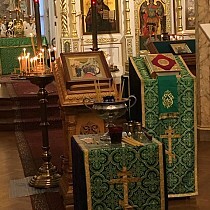 Upon conclusion of Liturgy, a short moleben was served with a procession with stations at the four sides of the church; by this time, the clergy and faithful were joined by Archpriest Yaroslav Belikow and Priest George Temidis, who had already celebrated the Sunday Liturgy in their own nearby parishes, in Novo-Diveevo and Mahopac, respectively. A Synodal Gramota was awarded to parish council member John Paschenko for his diligent and donated work in re-gilding the church’s cupola. After Liturgy, all of the participants were then welcomed by the parish sisterhood to an abundant and delicious luncheon in the parish hall next to the church, and the entrees and desserts left enough for the students of the Nyack Russian School to enjoy later in the week at their classes.